John Frandsens orkestermusik har en delikat, senromantisk aura. Men bagved det lyriske og umiddelbart indtagende ligger en stram struktur. Gestalternes bevægelse har en iboende dynamisk logik, som ubønhørligt driver musikken fremad. På denne nye Open Space cd hører vi symfonien Dæmonernes Dans, cellokoncerten Hymne til Isdronningen, Amalie suite og en arie fra operaen I-K-O-N. I Agitato 10:47 12,80 kr. II Adagio 6:34 9,60 kr. III Presto 8:52 9,60 kr. At the Yellow Emperor's Time (2003) 8:17 9,60 kr. Amalie Suite (1985) 10:10 12,80 kr. "Hymn to the Ice Queen" (1998) 20:58 19,20 kr. 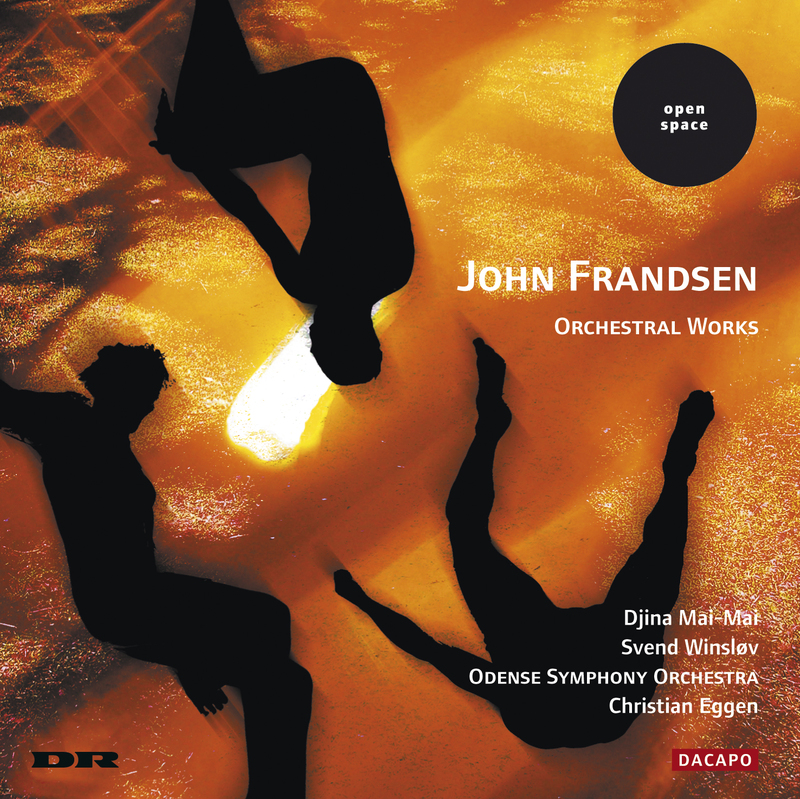 Melody is the quality most often singled out in the work of John Frandsen - his special melodic vein, the feeling for the finely wrought vocal melody that permeates his music; a melodic approach that the composer himself has sometimes characterized as surrealistic\. While this melodic quality is present in the bulk of John Frandsen's output, it is naturally clearest in the vocal works and the many operas - no fewer than seven so far: six chamber operas - three of these forming a trilogy based on Svend Aage Madsen's novel Tugt og utugt i mellemtiden ("Vice and Virtue in the Middletime") - and a full-length opera for full chorus and orchestra, I-K-O-N, commissioned and premiered in the spring of 2003 by the Royal Opera in Copenhagen. At the Yellow Emperor's Time (2003), the most recent work on the CD, is a central aria from the opera I-K-O-N. In this aria we find an example of John Frandsen's vocal art at its best, as well as an example of the surrealism to which the composer refers. It is moving in all its apparent simplicity. One is actual tempted to sing along. Yet that could be a risky business. The apparently so simple, repetitive melody constantly turns in new directions. Small displacements give the melodic flow new colours and freshness. Its realism and its recognizable melody are changed imperceptibly in a surrealism consisting of unforeseen turns. It is discreetly done. There is no attempt to over-embroider. Everything is exquisitely delicate and refined, and the result is thoroughly beautiful music that will give pleasure to all regardless of the background one brings to listening. At the Yellow Emperor's Time thus also demonstrates another side of John Frandsen: the sophisticated and delicate. This is particularly true of the orchestral setting which accompanies the aria. With its simple effectiveness it is itself worth studying. Its few but precise resources evoke a strangely transparent mood of fairytale, ancient times and the Orient, optimally supporting and building further on the fundamentally surreal character of the aria. Delicacy and sophistication also permeate the remaining tracks of the CD. In fact the two concepts are at least as central to the full span of John Frandsen's oeuvre as the often-remarked singability. In the oldest work on the CD, Amalie Suite (1985), the refinements thrive within chamber music dimensions. The music of the suite comes from John Frandsen's first opera, Amalie, and the ensemble is the same as in the opera - decet and percussion. Several types of music unfold here in a kaleidoscopic process with abrupt changes in the texture. The small melodic fragment of the oboe does however run as a constant strand through the otherwise highly varied music of the first couple of minutes (up to about 2:37). What then follows is a jewel in John Frandsen's oeuvre: a dense weave of brief motifs whose motions evoke echoes of fundamentally romantic music of the kind one can find in Schoenberg, Berg or even Mahler. Like passing ghosts the motifs move through the texture and leave the passage with an aura of something forever lost. The whole process concludes with the stroke of a bell, and the movement could in fact have ended there. But John Frandsen is not given to dwelling on melancholy. As a postlude we are invited up for a waltz; but the invitation fails to keep its promise: the waltz dissolves into its gestures, which finish off the suite as disparate elements pulling together. With the concepts of echo and Romanticism we can extend and clarify the sound of John Frandsen's music. True, Frandsen's music is structured quite differently from romantic music; but the elements from which the music is built often possess the aura of Romanticism - or rather late Romanticism. This is decidedly true of the two major works of the CD: the orchestral works Symphony no. 1, The Dance of the Demons (1986-88), and the cello concerto from a good ten years later, Hymn to the Ice Queen (1998). The Dance of the Demons, the older of the two works, is an assuredly composed, outward-looking, clear and effective symphony in three movements that are at the same time contrasting and interrelated: a fiery first movement, a lingering second and an ostensibly lighter third which along the way incorporates the sound of the first movement. The first movement exhibits well nigh all the elements that appear and develop in the later movements. Thus one can see the second and third movements as expositions of incompletely elucidated elements from the first. But one can also hear the whole symphony as a constant transformation of a simple basic idea. One thing that particularly strikes the ear is the third movement's ‘negative' version of the low instrumentation's rumbling opening of the first movement. In the third movement this is turned into a rousing skipping motion at the higher pitch. If the violent energy discharge of the opening is worlds apart from even the Romanticism of a Schoenberg, the second movement may recall the adagietto of Mahler's Fifth. They may have nothing specific in common but a special mood of wistfulness, a remote echo of the romantic. This lies like a substrate in the symphony and at several points breaks the surface, but rarely as clearly as in the second movement. "If one is out on a night in August when the Midnight Sun sheds an unreal, magical light over the Advent Fjord, one can almost hear all these forlorn destinies and shattered dreams. From the black depths of the Arctic Ocean, from the abandoned mine shafts, from the glaciers and caves sounds the echo of a hymn. The spirits are singing their hymn to the cruel, beautiful Ice Queen of Svalbard." If one thinks in abstract musical terms, it is again the echo of a (romantic) pathos that one encounters in this movement. But rarely is such an echo formed with such yearning beauty as John Frandsen forms it here. In this cello concerto John Frandsen gathered the strands from the 25-odd years he had by then been active as a composer. Besides the romantic aura of the music we find perpetually borne, singable melody lines and delicately refined orchestral treatment controlled by an extraordinary sense of timbre. Behind the lyricism and the immediately appealing music - indeed, as their precondition - there is thus a tight structure: precisely the element that gives the music its character of inevitability.